I had to share this with you right away. 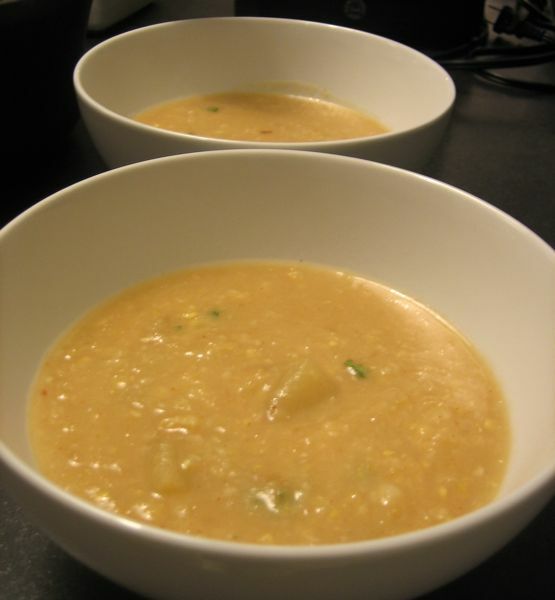 Tonight’s creamy corn soup with knobs of tender potatoes and juicy corn kernels was sweet, spicy, fresh and belly warming and above all so quick and easy. Here in New York, Fall has been rolling in and out battling against the few 80 degree days we’ve had bookending them with rainy, chilly fall days. Apparently, Fall is as unhappy to see me as I am to see it. To ring in it’s arrival, it gifted me a cold – one of those weather change colds that’s made worse by the constant a/c blasted into commercial buildings even (especially) on days when it’s not needed. This soup really hit the spot. Not to mention, it dirtied one pot and my blender and was ready in about fifteen minutes. Really, I’m all for shortcuts but is that any more effort than opening a can of soup and heating it up? 15 minutes. Sweet. Spicy. Fresh. Belly warming. Do I need to say more? In a large saucepan, heat about a tablespoon or so of olive oil on medium heat. Add the onions and saute until translucent. Add the corn and cook for another 3-4 minutes stirring frequently. While these cook, peel and chop the potatoes into one inch pieces. Make them small so they boil quickly. Add to the saucepan along with 2 cups vegetable broth. Cover and increase temperature to medium high. Bring to a boil and continue cooking until the potatoes are tender. Stab them with a fork to test them. Allow to cool then transfer to a blender reserving about a cup of the potato/corn/onion mixture. Pulse just for a minute or so (really a few seconds should do the trick unless you prefer the corn really pureed). Transfer back to the saucepan on medium heat. Stir in the milk along with salt, pepper and sugar. Cook for 3-4 minutes. Adjust for salt, spice and sweetness. Add the reserved potato/corn/onion immediately before serving. I garnished with cilantro but it really didn’t add much. Superb! Just one dirty pot and your blender. That’s really easy.Must try whisking this soon. Thats a superfast and delicious soup! i posted a soup too…yours is something new and looks delicious too..
Its raining here..i could def use some of this soup..slurp! This looks like the perfect comforting dish for fall – yum! YUM Nitya. This is just my kinda soup – snappy & quick to make, and with so much good flavour. Belly warming…aaaaah…I love it! This does look amazingly creamy. Love the corn-potato combination! this sounds great- I wonder if canned or frozen corn would work once fresh isn’t so readily available. ND: I think that would work…I would maybe experiment with a mix of sweet corn and regular white corn.